The seminal moment for Picasso was the Paul Cézanne retrospective held at the Salon d'Automne one year after the artist's death in 1906. Though he previously had been familiar with Cézanne, it was not until the retrospective that Picasso experienced the full impact of his artistic achievement. As he later put it: "Cézanne's influence gradually flooded everything." 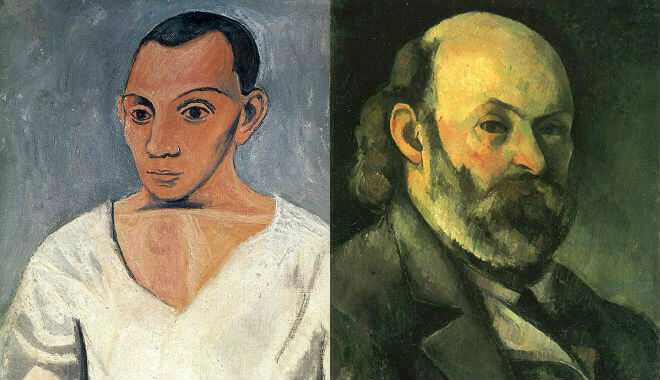 Pablo Picasso regarded Cézanne as a "mother hovering over," Henri Matisse as "father to us all." Inevitably, our understanding of Cézanne's painting is colored by later cubism and abstraction, focusing attention on the formal aspects of his work. His reduction of the visible world into basic, underlying shapes, the faceted brushstrokes that seem to reconstruct nature through purely painterly forms, the fracture and flattening of space - all these can be seen as the beginnings of modern art. Yet Paul Cézanne himself stressed that he painted from nature and according to his sensations, seeking to realize a "harmony parallel to nature." Cézanne's insistence on redoing nature according to a system of basic forms was important to Picasso's own interest at that time. In Cézanne's work Picasso found a model of how to distill the essential from nature in order to achieve a cohesive surface that expressed the artist's singular vision. Beginning in 1907, Picasso began to experiment with Cézanne's techniques alongside fellow artist Georges Braque. Cézanne was a constant touchstone for the two artists during this period of collaboration, which eventually resulted in the invention of Cubism by 1909. Throughout Picasso's stylistic evolution over the next seven decades, he continued to borrow from and reinterpret Cézanne's art.